This stylish stainless steel dog tag necklace is a great accessory to any wardrobe. Not only are dog tags very popular, but with a custom engraving you can be sure to wear something that is trendy and unique. 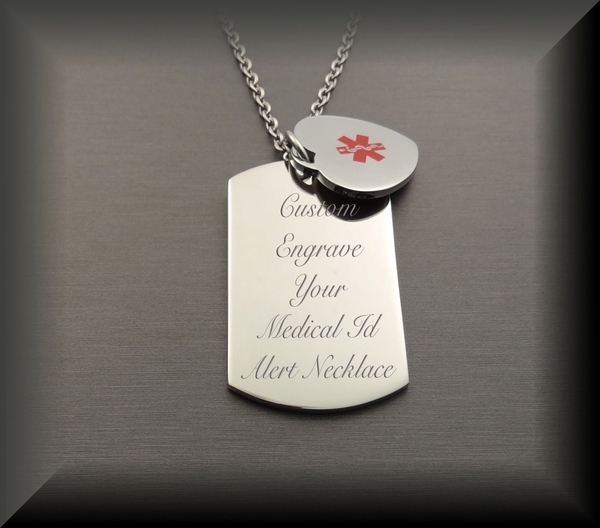 The dog tag can be engraved with a name, initials, short message or engrave the dog tag with your medical information. 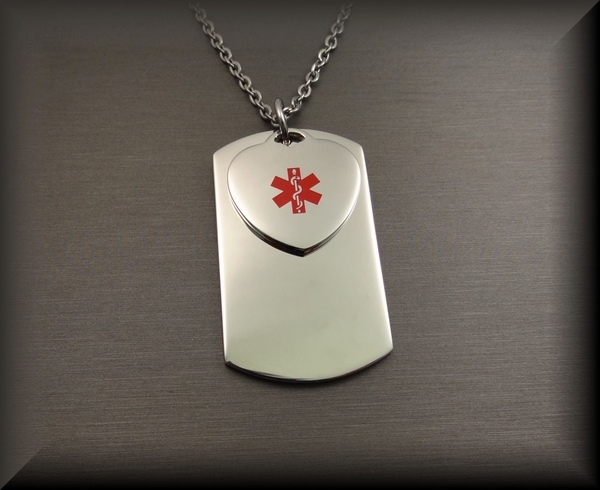 The engraved dog tag includes a necklace along with the pendant [pictured]. The dog tag measures 1.125 inches wide x 2 inches tall. These quality engraved necklace pendants will add an individualistic style to your wardrobe as well as providing medical information in case of emergency. There are several different designs ranging from masculine dog tags to feminine heart pendants. Each engraved pendant includes an appropriate sized chain. There are many font styles to personalize your engraved gift with. Don't forget to check out A & L Engraving's complete selection of personalized jewelry, including i.d. bracelets and photo pendants.